I did new test for both versions. Imager was the only running program. If you carefully inspect the images, is the quality the same, or are there differences? And you have the Imager Preferences: # Processors set to Use All Processors for both v7 and v8, right? Isn't it important to list how many cores are performing the test? i should also note that my test was v7 not v8. It is assumed that all cores are being used, and you can tell how many cores are available based on the generation of the Mac, or the specific processor being used. Since it is showing 800mhz and not 1333mhz, you have a problem with your memory, whether you realize it or not. You are leaving a good bit of performance off the table by the much slower RAM speed. I suspect 1 of 2 things happened. Either the system was upgraded using the wrong memory, or at least 1 of the memory sticks is failing or mismatched, causing them all to run at only 800mhz. justin, thanks for bringing this to my attention! i'm using 5 mac pro's of different types here, and after setting up the machines some years ago, i never double checked the RAM speed with the system profiler anymore and this got me confused. as a matter of fact, 800 mhz was the memory speed in older mac pros's! indeed, i have 10600R 1333 mhz memory installed in all my slots, but apparently, the system is reporting it in a wrong way. i did some further tests and as i said before, all seems good here. then i found a thread on apple's forums about this issue, where it results unclear if this is because the mac pro memory manager is not reporting correctly or if it is a compatibility problem with certain brands of memory. that said, i also read that technically, the mac does never 'downclock' any RAM - it would simply report that i can't be used with that model. also, i never had any issues. all my other render applications (lightwave, maxwell, vray) work at the highest and expected speed. also, if i compare my maxwell benchwell values with other similar mac pros' in the database, they are perfectly in range. in conclusion, the FZ RZ speed should not be affected in any way by this. however, this story got my attention and i will further investigate to know more about that! cheers and thanks again for the comments. It seems that if you limit a 12 core Mac Pro with this test file to 6 cores get much better results. i did also try 6 cores but didn't get near anything reasonable... at this point i guess it's a compiling issue. Will try with less cores on Mac mini and also see how powerbook does . FMB possibly post some different projects so we can compare speed with different standards (no radiosity/ final gather etc). I think there's some strange threading issues going on here... at least on the OSX side. So setting my Mac Pro at 12 cpus, thereby disabling hyper threading gives the best results. I remember years ago, FormZ having issues with Hyper threading in OSX, but I thought that had been resolved. My next step will be to test in Windows 7, which by looking at the other results, may have much higher performance. If that's the case, we'll need to find out what's happening in OSX to make is so much slower. I feel like I should be rendering much fast than this, and that there is a threading problem in FormZ. If I compare to my other renderer, Maxwell, results, I'm consistently at the highest on OSX, often faster than the same spec Windows machine as well. Hopefully Autodessys can chime in here. Tech your fmz test file for 7 does not download in Safari or Firefox? They do not find file? Both Imager versions are set to use all processors. The quality of the images are almost the same (v7 5440x3520, v8 5100x3300). That's strange, the image resolutions are different? Please download from the link above and try the tests once more. Does that give you different results? I did test with new files. Both images 5100x3300 looking almost the same, some differences in shadows. Ok, that makes a bit more sense (although we are still surprised why formZ 8 is not faster on your computer). At least the values are now in the right ballpark! Imager seems to have broken again... When I originally went to do the test Renderzone was not an option. I reinstalled formZ 8, then ran imager, reregistered the programs and all went well. Saw Renderzone was available, then started to run the test but much like Markus' comment (I also have the Mid2010 12 core} gave up after about and hour and had to Quit and get back to work before completing so I Force Quit. Just went back to try and do the test now and find I am back at my original state of not having Renderzone as an option. Nuking the preferences didn't do the trick so I guess I'll have to reinstall and try again. If you make sure you have Read / Write Preferences to the formZ Folder and enclosed items, and Repair Permissions, does that help? And with OS X, it is recommended that you set the Imager: Preferences: # Processors to the actual number of cores (and not the virtual cores). Does setting it to 12 (or even 6) help? maybe it would be interesting to have a modeling only benchmark to see how FZ performs with modeling tasks like booleans etc on the different machines. maybe this can be achieved by a script? as most modeling operations are single threaded, this would also avoid the issues with the unoptimized RZ engine on 6 core machines, mac pro's etc. I downloaded FormZ as you wrote yet RenderZone option does not show in imager. Go to the Finder: Go Menu, hold down the Option key, choose Library: Preferences: autodessys: -- and delete the formZ 8 Imager folder. Next, go to Applications: Utilities: Disk Utility, choose your Hard Drive, and Repair Disk Permissions. 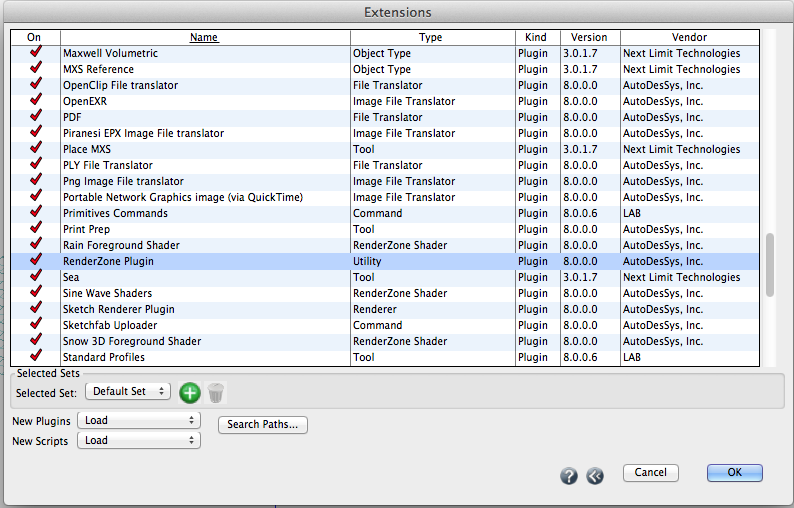 If you go to the Imager: Extensions Menu: Extensions Manager, is the RenderZone Plugin listed, and does it have a red checkmark to its left? Also, if you Quit the Imager, go to Applications: Utilities, run the Console, click the Clear button, then launch the Imager, can you copy and paste the contents of the Console and email it to us so we can see what that indicates?